Conway Scenic Railroad owners, Dave & Rhonda Swirk, loan us their train for a fantastic, five hour foliage excursion from North Conway through Crawford Notch each October. We take 5 x 7″ photos of departing guests, frame them and deliver them on board. Kiwanis hosts serve delicious appetizers on the way up while a narrator tells the story of the railroad and the scenery along the way. 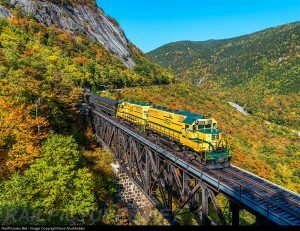 Lunch is either a pre-ordered box lunch, sandwiches from the on board Snack Bar or dining car options for a three-course meal on the train. First Class passengers can take advantage of the dining cars and full bar. Train accommodations include a glass dome, first class and coach. There is an open air car for photographers. On the way home, visitors are treated to a wide array of desserts and a chance on a raffle. There are stops along the way to photograph the train coming round the bend at full speed and to visit the old Evans homestead and Hattie’s garden. 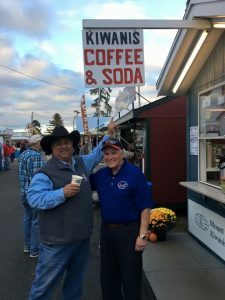 Members man a coffee booth at the fair for 6 days Sunday through Friday from 7 a.m. to 9 p.m. with the Key Club working the booth the final weekend. Shifts are three to four hours and almost everyone in the club participates. Fair passes and parking are two perks. Hale’s Location and the White Mountain Hotel are hosts for this event sold out every year. Seventeen teams compete for prizes and enjoy a hearty luncheon. 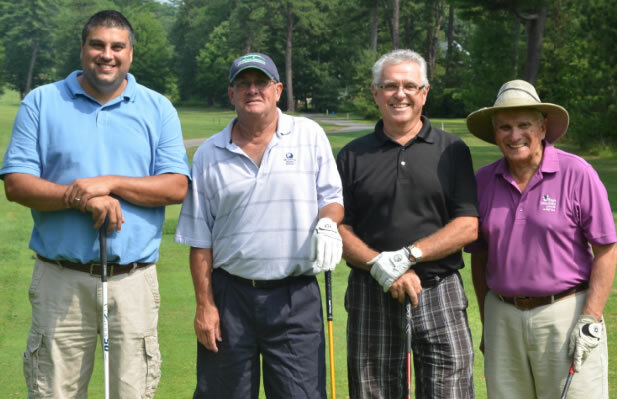 Members participate by helping with prizes, scoring, tee signs, and guiding players on the day. Members also help with finding local sponsors for the event, sponsors for holes on the course and sponsors for golf carts. Although not a fundraiser, we enjoy getting all the sponsored clubs together. White Mountain Golf is our host for a game of min golf. There is also volley ball. The club sponsors this event to provide a day of fun for members and their families and those associated with the various organizations within the larger Kiwanis Family such as the Key Club at the high school level, Builder’s Club at the junior high level , and all the elementary school K-Kids groups. A cookout completes the day. 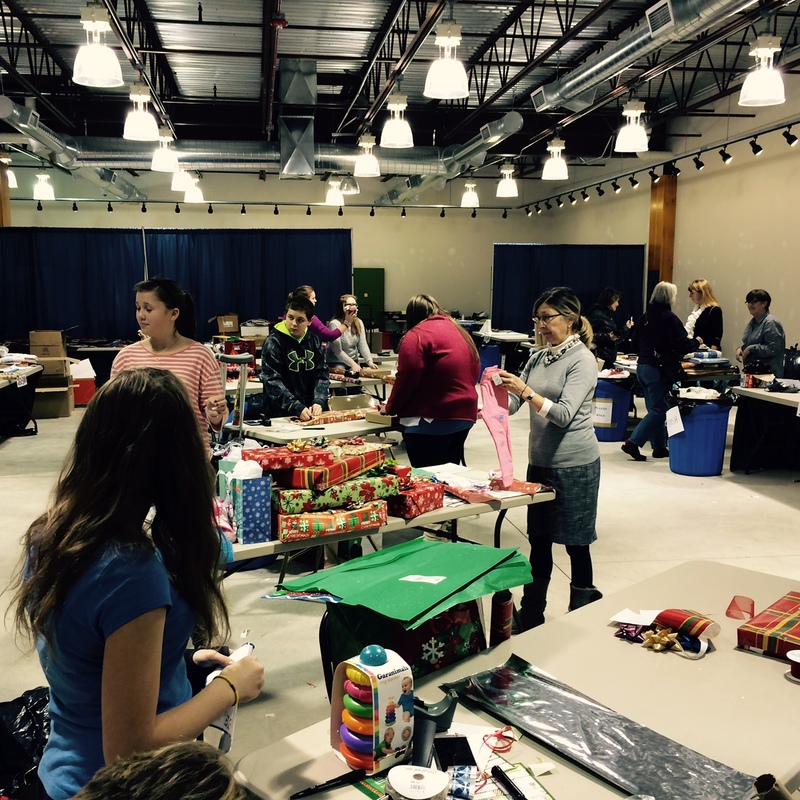 Angels and Elves is a community-wide project coordinated by our club. With the help of many non-club workers, donations from hundreds of individuals, local organizations and merchants, holiday gifts are purchased and wrapped for approximately 650 needy children. This number is very close to the estimated poverty rate for our valley. Over half the club gets very involved with Angels and Elves and most members will support a child or two. Applicants let the club know each child’s list of needs and wants. 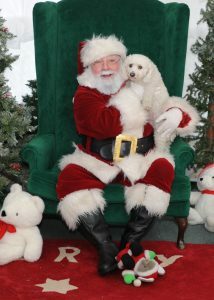 Photos with Santa is a fundrasiing project that starts in late November and runs through December 20. Shoppers at Settlers Green which hosts our club project can get their photo taken with Santa. 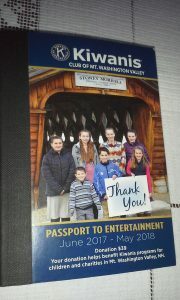 Our main fund raiser is the Passport Book to Entertainment. This is a win/win for the restaurants and recreational facilities in the valley, for the club and for the people who buy the book. Two-for-one coupons encourage book purchasers to try new places and in the end the valley kids benefit. 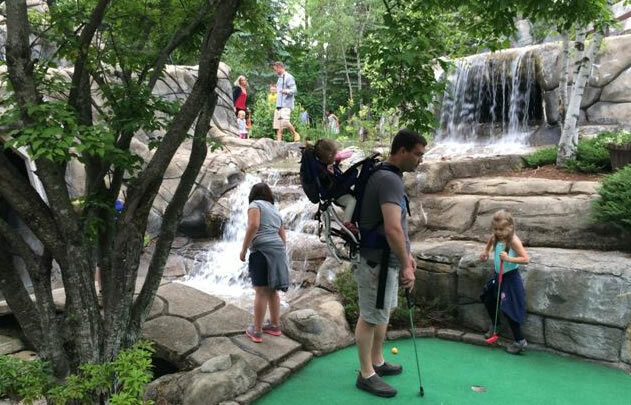 Coupons range from dining to ski passes to golf to Story Land. Each club member is responsible for selling books. They fly from your hands as this is a most popular item in the valley. Makes a great gift. Order gift certificates for next year’s book as a holiday present. Each Kiwanis year varies. 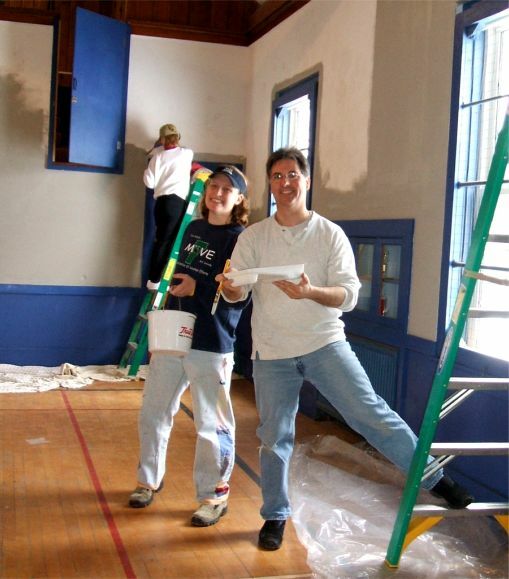 Sometimes we paint a non-profit building like the North Conway Community Center. We always pick up the roadside along Rt. 302 each Spring and Fall. 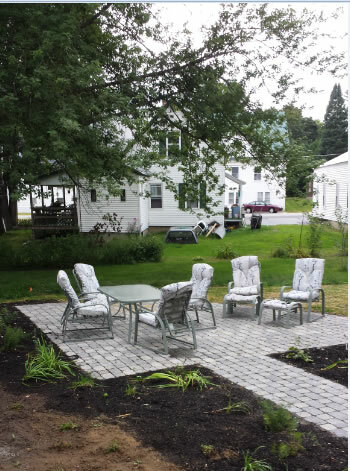 We have painted the North Conway Day Care, Children Unlimited, the Mother Seton House in Fryeburg and renovated the old Starting Point home for resale so the organization could move to a better locations. 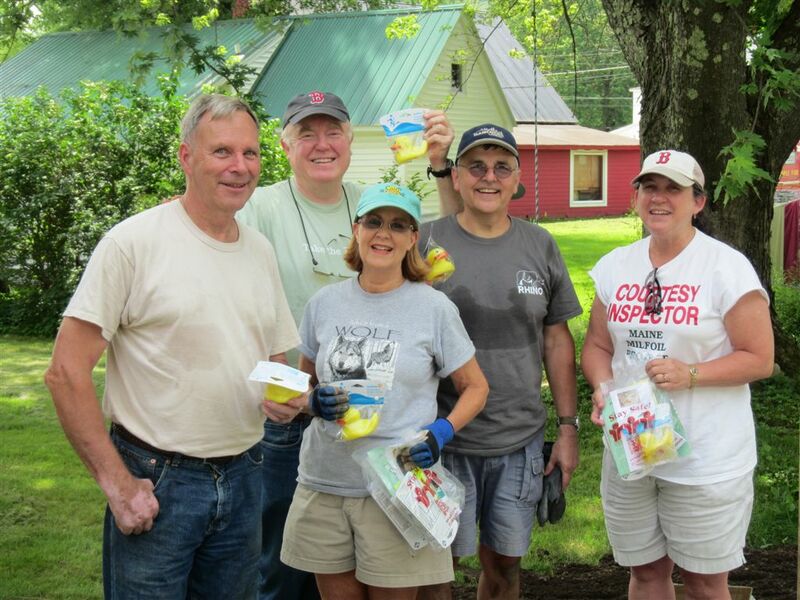 Members have also helped set up the bunks and swept the beach at Camp Huckins. We award several camperships each summer.